Well I have been busy away from the koi ponds. I traveled to Virginia for a few days and my husband surprised me with three new koi from Kloubec Koi Farm in Iowa when I returned. He found a shusui, a midorigoi and an ochiba. 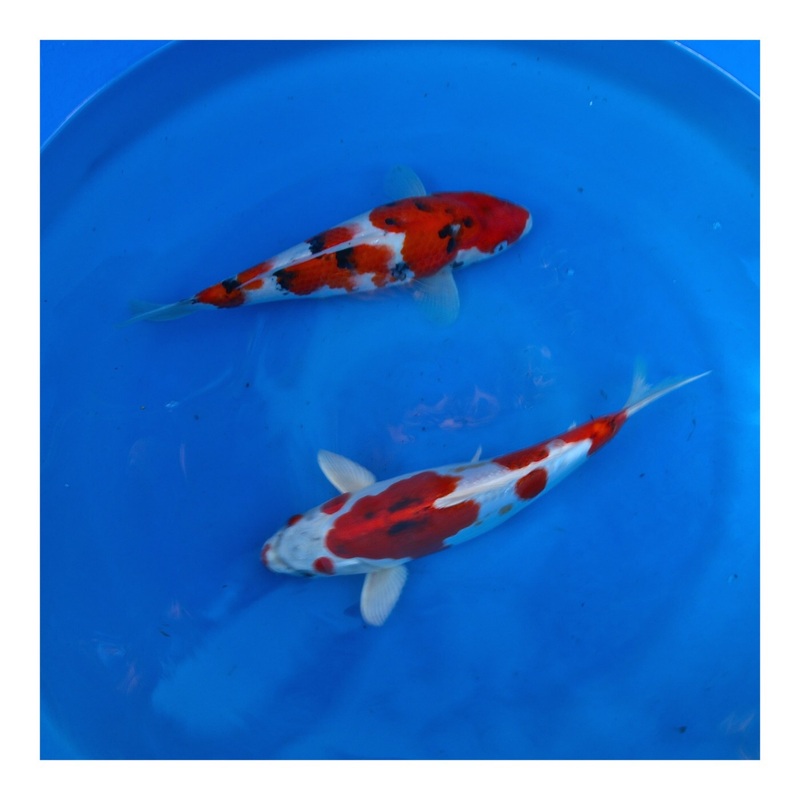 The ochiba is a very friendly koi and while he/she may not have a falling leaves pattern, he/she has very nice coloring. The shusui is our sad story today. The shusui lasted about a week in the lower pond. Liked to play around the pond skimmer and looked to be very lively. I have been wanting a shusui for some time. It’s basica lly a scaleless version of the asagi. So on Friday morning my husband noticed the waterfall was not running. 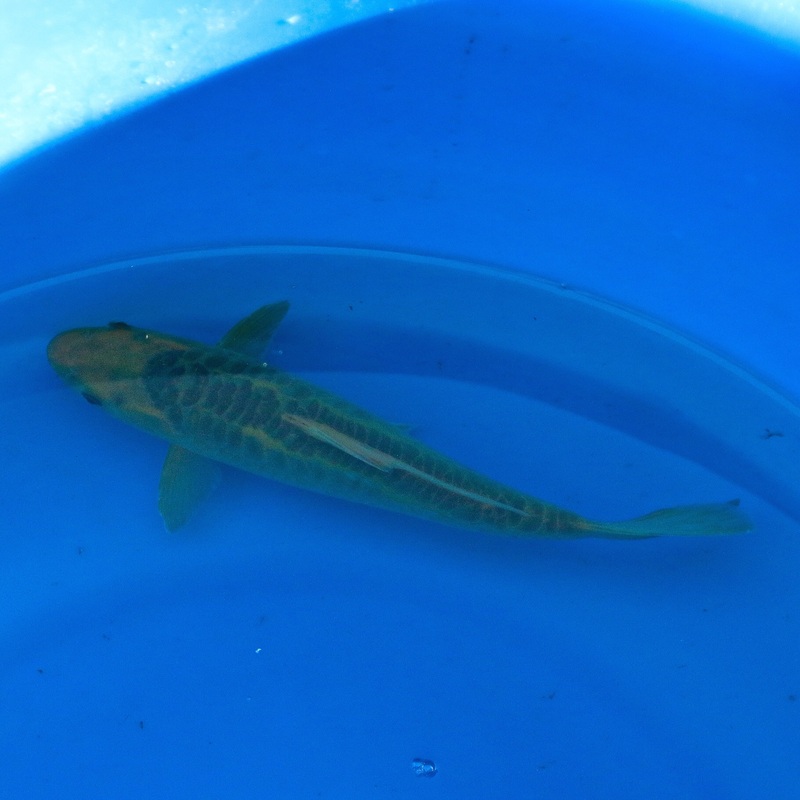 He went out to check the pump and found the dead little koi in the skimmer box. It’s possible that he swam into the bottom drain or got into the skimmer and somehow managed to get out of the net and through the brushes to stop the pump. Hopefully we will not see any more pump/bottom drain mishaps. 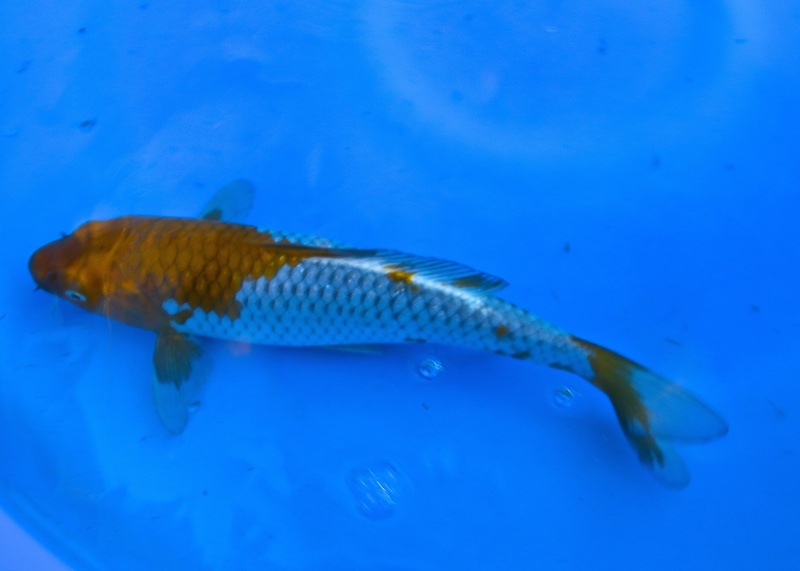 The mido rigoi is an interesting koi. It was bred to be green and it appears to have some greener streaks down it’s back and sides. We’ve named this koi Verdell. Verdell is about 10 inches long right now. We spent most of today putting nets on the waterfall and smaller pond, cleaning up the leaves and cutting back plants for the winter. While we were gardening, my husband suggested putting all the koi back together in the large pond. We had split the group to get the bacteria going for the winter pond a few weeks ago. 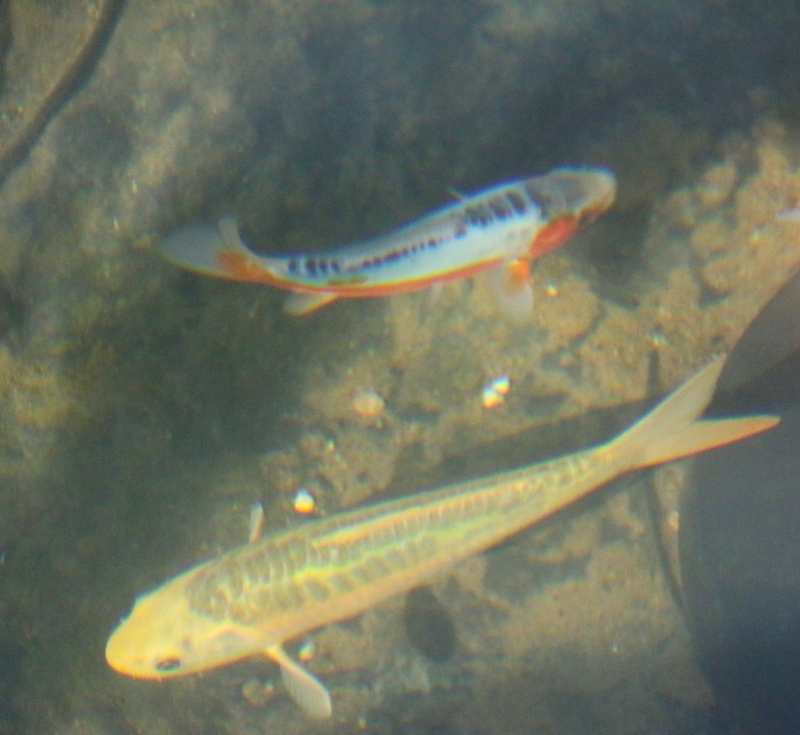 When the koi were split, the ones left in the large pond actually seemed to sulk around and barely ate anything. The koi below seemed okay but were always hunting around for some algae covered rocks. We transferred the koi in the lower pond back into the upper pond and all the koi immediately seemed to swim better and they ate their food. While I’m not sure if they missed each other, the bigger koi certainly seemed to perk up having the smaller koi around again. The Tancho had some adjustment issues but he was swimming with the pack after 20 minutes. at the beginning, he swam along the rock,line and looked,for places to hide. He also wouldn’t swim deeper. 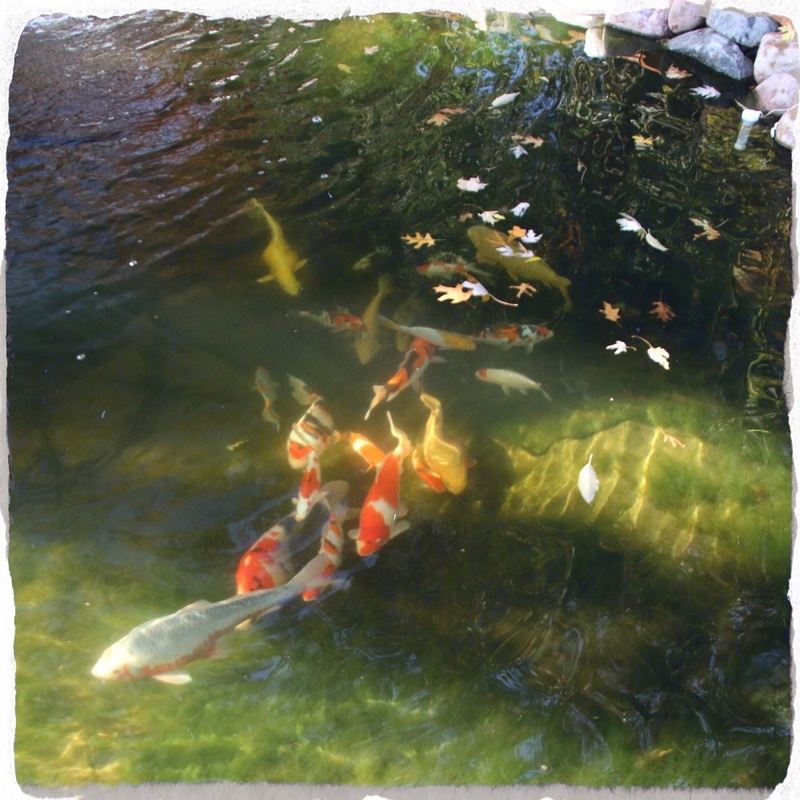 A few of the koi would join him as he circled around the edges of the pond. The midorigoi was a little unsure of the pond and hung around in the shallow area for a few minutes. I’m hoping we didn’t stress out the koi too much. All in all a good day with the koi.